Dangerously delicious six ingredient, three layer chocolate and caramel Vegan and Paleo Millionaires Shortbread. 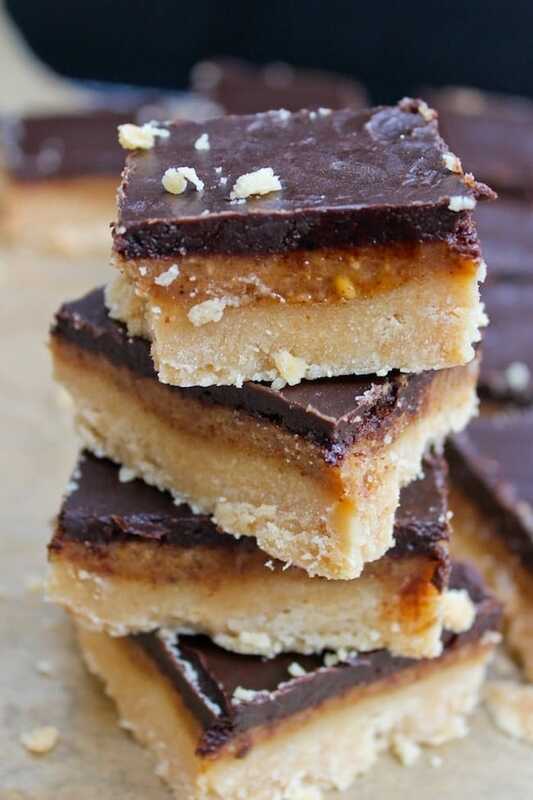 Now, I’m not really one to brag or anything, but these Paleo Millionaires Shortbread squares are Ah– M A Z I N G . It’s actually a problem how good they are because I want to eat them all…at once. Altogether these millionaires are super easy to make. The three layers are made up of only six total ingredients. The hardest part here is waiting for the individual layers to set. Start off by prepping the coconut flour crust. Simply mix together all of the shortbread crust ingredients together in a mixing bowl (oil, flour, syrup and vanilla) until a soft dough forms. Gently press the dough into an 8x8inch baking tin – ideally one with a loose bottom for easy removal. At this point the dough might feel a little oily – that’s totally normal. If you want you can take a paper towel and lightly dab the top of the pressed out dough to absorb some of the extra oil. The caramel & chocolate layers are made in the same way – just one at a time. First make the almond butter ‘caramel’ by melting together the almond butter, maple syrup, coconut oil, vanilla and salt together in a small sauce pan. Melt on a low heat and make sure to stir well to mix together until a thick, silky mixture forms. 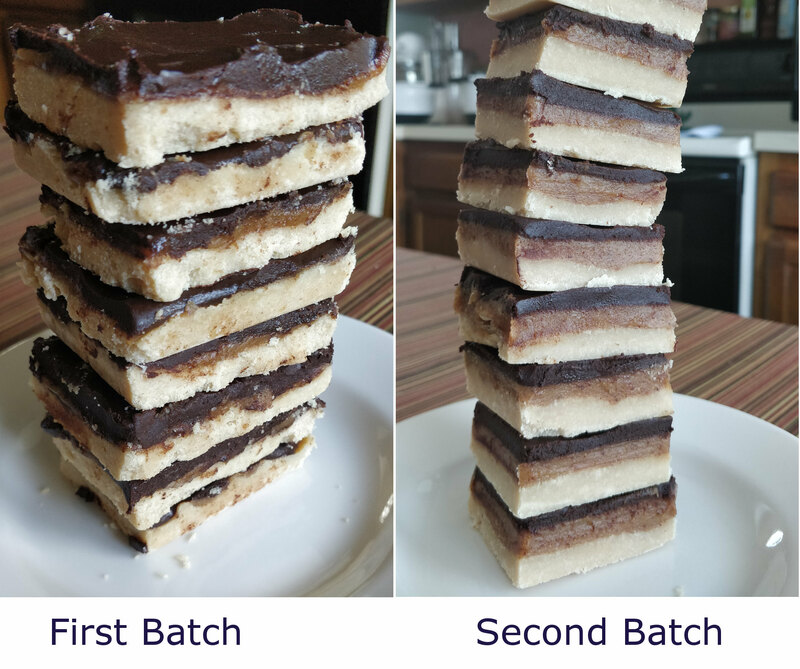 Pour the caramel layer over the shortbread and place in the fridge to harden while you work on the chocolate layer. Make sure you allow the caramel to harden before adding the chocolate or else the two layers will mix into one. It’s also important to allow the chocolate layer to cool to room temperature before pouring over the caramel so it doesn’t melt the layer below. Once poured, allow everything to fully set and that’s it! Not only are these chocolatey, caramel millionaires refined sugar and grain free they are also vegan. The best part about vegan baked goods? The fact that you can lick the spoon at any time without any worry of salmonella. Not that that ever came between me and my cookie dough. I mean, what? The prep for these little slices of heaven is actually pretty minimal, requiring only six ingredients and a melting pot or two. The worst part is having to wait for the caramel and chocolate layers to harden in the fridge before going to town on these. But trust me – they are so worth the wait. Seriously. You need to make these so we can discuss how freakin’ delicious they are. Don’t forget to #asaucykitchen on instagram if you try these Paleo Millionaires! I’d love to see what you make with it! You can also post your pictures to my facebook page! In a small bowl mix together your shortbread ingredients (the coconut flour, maple, oil, and vanilla. Press the dough into a lined 8x8 in baking tin to make the bottom crust. Set aside for later. In a small pot melt the caramel ingredients on a medium low heat for about 3 minutes (the maple, oil, almond butter, and vanilla). Make sure to stir while everything melts to keep from burning. Let cool for a couple of minutes then pour over the top of the shortbread crust. Cover and refrigerate for about 30 minutes to set let the caramel set. While the caramel is setting, begin making the chocolate by melting the coconut oil in a small sauce pot first. Stir in the maple, cocoa powder, vanilla and salt. Make sure there are no remaining lumps, then remove from heat and cool. After the caramel has firmed up you can pour the chocolate over the top, spread with the back of a spoon to even out the top, then cover and refrigerate for 30-60 minutes until firm. Before pouring the chocolate over the top of the caramel you want to make sure that the chocolate isn't too hot still or you'll end up melting the caramel which and you won't get those individual layers. Store these in the refrigerator. Leave me a comment letting me know what you think, and if when you do make these Paleo Millionaires don’t forget to snap a picture and tag me on instagram @asaucykitchen so I can see too! I love finding healthy dessert recipes that taste good, but I also eat regular desserts too. I liked this dessert but was not a fan of the bottom crust layer. I think the bottom layer takes away from the amazing top two layers. I would like to try this again with a regular shortbread crust with the top two layers in this recipe. The middle layer is to die for when it is still warm! I could eat that by itself! Anyone who makes this, please try a spoon of the middle layer while it is warm! I’m so with your on the middle layer! Thanks Amity! Hi Sarah, can I use honey instead of maple syrup? Hi Loren! That’s totally fine! Can you use carob powder for the chocolate layer? That’s fine! It will change the overall taste, but if you like carob then that shouldn’t be a problem! I tried carob and for some reason once I stirred it all in it separated and clumped. I tried a 2nd time with the same result. The chocolate worked perfectly. Let me know if your carb batch works and how you did it. Hey! Do you think you could replace some of the maple syrup in this recipe with coconut sugar or Swerve and still have it work? Thanks Rose! Glad you liked them! Great recipe! I love these. However, yours look thicker than mine. My caramel layer is so thin that it’s barely visible. Did you use a smaller pan or double the ingredients for your pictures? Thanks Laila! I’m so glad you liked it! 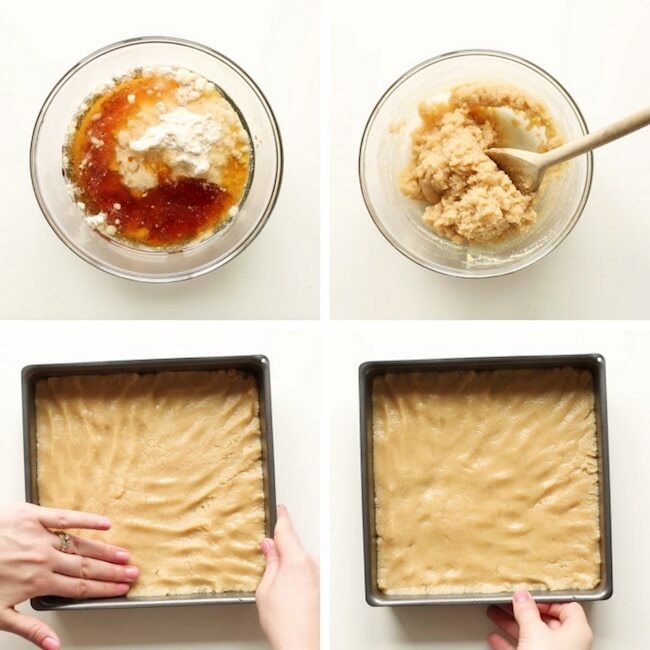 I’m not sure why the caramel layer is so thin though – are you using an 8x8inch square tin? How would you say you caramel thickness compares to the one in the video just above the recipe? Yay! That makes me so happy to hear – really glad you all enjoyed it! I’ve made 5 batches of these. A sure winner for anyone who’s health conscious but still loves sweet treats. Even made a batch for my work’s bake off and they went down really well! That’s so awesome! Thanks for much for coming back to share that Sjaun! Glad you liked them! I haven’t frozen these exactly but I have frozen similar type things and usually you need about 20 minutes before they’re soft enough to cut easily. As for keeping them in the fridge, they’ll keep a minimum of a week – they usually end up eaten before that but I think they’ll keep even longer. Thanks for coming back to let me know what you thought! Looks so good! Can’t wait to try Christmas! Have you ever tried making these in a mold? Wanting to make these in a Christmas tree shaped mold and then flip them old to have it desert come out in a Christmas tree shaped. Wondering if I should grease the pan and put the layers in with chocolate going first so that when I flip it, the crust layer is on the bottom. Totally not even sure though if this will hold up outside of the mold. Thoughts? Thanks Rebecca! I haven’t tried them in moulds yet but I really love that idea! I know the chocolate & caramel layers will hold up but I’m not sure about the shortbread. I think it would, but getting them out of the mould might be tricky. I don’t think you’ll need to grease them – the coconut oil gives the shortbread a greasy kind of feeling before it sets. Any more might be too much. If you try them out in moulds please let me know! Ummm…so much yes. These are INCREDIBLE! My sister is a master baker and used to make these (with regular flour, sugar, and chocolate) under the name of Irish Toffee Bars. I try to always make clean versions of yummy desserts for my family, and boy did this deliver! I was unsure how the almond butter caramel would turn out, but it’s divine! My husband only likes dark, dark chocolate (no milk, no white) so I can’t wait for him to try this!!! Thank you!!!! These will become staples in my home! I brought them in to work from rave reviews (from people who sometimes chuckle at my dietary choices, haha), and plan on baking them for an upcoming school bake sale. May I have your permission to share your recipe (with full credit given of course!) on a little blog I created to share healthy recipe finds with friends? I’m attaching the site so you can look at it. As you can see I haven’t updated in awhile; school started for me so things have been pretty crazy! These look so good!! My son has to take a plate to share to a Halloween celebration this week and I am going to sub the almond butter for sunbutter or tahini seeds and take this. Thanks! I really want to make this with tahini now because that sounds awesome! Hope you and your son enjoy! These are something very special! I’ve just finished the first batch but will making another batch this weekend without doubt! Aww thanks, Corrina! So glad you like it 🙂 Thanks so much for coming back to let me know what you thought! I am finally have all of the ingredients. Can I make this in advance or will it get soggy? For example, make on a Friday for the following Wednesday night? Thank you again!!! Hi Sarah, I will love to make this bars! Will the coconut flour raw leave like a flourly after taste? If baking it for how long it should go? Thanks so much! have you tried both baked and raw? which would you recommend? and you are saying “coconut flour should leave a floury taste behind”? Or it should NOt? thank you! That makes me so happy to hear that you’ve found something she can enjoy! Thanks Carla! Hi Sarah, these look amazing! Question, can you use stevia instead of maple syrup? And if so, would adding more coconut oil help keep the consistency? Hi Matt! I don’t have a lot of experience when it comes to using stevia so I’m not entirely sure, but the maple in the recipe is mostly just for taste and volume – it doesn’t change much about the texture or consistency. 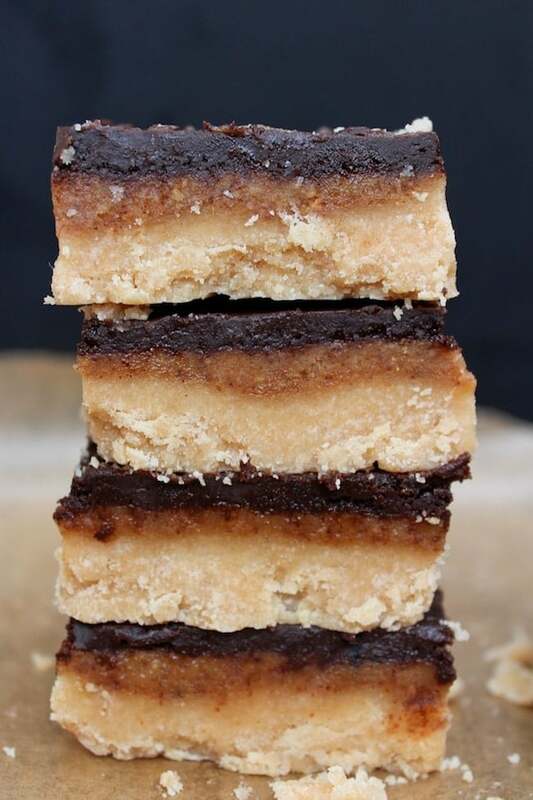 I don’t think you’ll need to add any additional coconut oil for the caramel or the chocolate layer but you may need to add a little extra in the shortbread layer if the dough is too dry – I think it will be fine, but you might need to add an extra tablespoon or so at most. Hope that helps! I didn’t have any coconut flour on hand but have other paleo friendly flours, ie. almond and casava… will they work? They can work but you’ll need more flour than you would use with coconut flour. I’ve yet to make these using anything like almond flour before so I can’t say for sure how much you’re going to need. If I were trying to make it with almond flour I’d start by doubling the amount of almond flour. You want the dough to be thick and sticky when you press it into the bottom of the pan. Add more flour if you need tablespoons at a time. Hope that helps! Yes!The only thing I might recommend is to decrease the amount of coconut oil in the crust just slightly. Instead of adding 1 full cup try 3/4 cup + tablespoons. If it feels like the bottom layer needs it you could always add the remaining 2 tablespoons. Hope you like the recipe! Making this now. The ‘dough’ is not dough-like at all and is like wallpaper paste!! What have I done wrong or is this how is should be? I’m adding more coconut flour but it’s still very runny..
Hi again, I used 112 g coconut flour, 158g maple syrup and 108 g coconut oil as per the recipe. It’s rather tasty and now it’s done, the base layer is fine! It was just really sloppy at the time rather than doughy. I love the caramel layer in particular! Really yummy. Thanks for this recipe. We need more alternatives to nasty processed foods! Overall, it came out ok in the end…! Is the coconut oil melted or solid when you measure? The recipe says “lined 8×8″ pan” – with what do you line it? Would it work to just grease the pan with a little coconut oil & bake the crust? Thanks Rebecca!That genuinely makes me happy to hear! Any suggestions for an alternative to the top layer? I’m SCD and cannot have chocolate. These look amazing! How are you with nuts? I made this somewhat recently and threw on roasted peanuts on the top instead of chocolate because we were out of cocoa powder. The added texture was nice and I didn’t feel like I was missing the chocolate. Hope that helps! I can do nuts. That sound fabulous, thank you! You could try using palm oil. It’s semi solid at room temperature also. Thanks Alyssa! I didn’t even think of that! I’m allergic to almonds. They give me really awful eczema. Any substitution for almond butter? I’m not vegan, but I do attempt to stick to the GAPS diet for the most part. I’d love to try these if there are options. I just made this and tried it. It’s wonderful! Just 2 bites satisfied my sweet tooth craving. I even made some strawberries to go with it. Sprinkled some turbinado sugar over them so it would be a strawberry, chocolate, caramel shortcake. Yum! Thank you for this recipe. Yay! So glad you liked them! I love the idea to add strawberries – definitely going to try that the next time I make them. Thanks for coming back to leave a comment! Pretty sure you shouldn’t eat the whole dang pan in one day. Yup. They were THAT good. Hubby didn’t like them but he’s so over coconut oil. My LO’s ate what few crumbs I threw to them. Never never making again. No self control. Haha I know the struggle! Thankfully my husband is more of a chocolate fiend than I am so I usually have to fight him for desserts 😀 So glad you liked them! Thanks for stopping back by to leave a comment! Hiya! What is the nutritional value of these? I don’t typically care for the taste of maple syrup. Does it stand out against the other flavors? Made this and it was delicious. It is very rich. These look awesome! But wouldn’t you have to bake the bottom crust to give it that “shortbread” texture? These were LEGIT! Actually really easy and fast. My husband lost his mind. Thank you! This looks wonderful. I’m vegan and I don’t have an oven, so I want to make these. Can I make these with a different kind of flour– something cheaper (if not paleo thats ok for me)? And do you think that the crust would still be amazing if it was used for a different recipe or is is really meant to work with this one only? And just in case you don’t know how – you can make your own oat flour at home by blending regular oats in a blender until it becomes like a fine powder….I hope that helps! Perfect!! This looks amazing ..I’ve never had these before .. I can’t wait to try them!! wow, scrumptious and I’m all over these ! Wow, delicious and healthy! I totally need to make these!! Thanks, Oana! You won’t regret it if you do! Looks absolutely mouthwatering, I can’t wait to make them! These look amazing and no bake to boot! Yum! 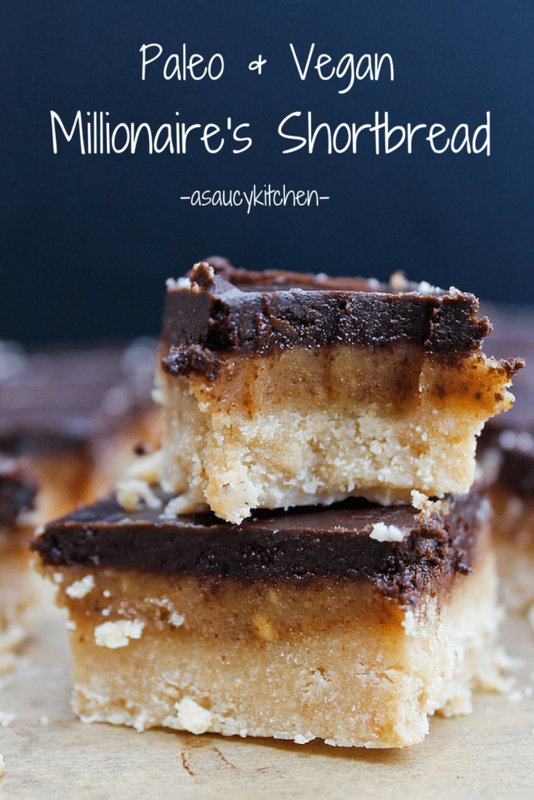 You could also call this million dollar shortbread, looks like a million bucks to me! Thanks for sharing this one!! Haha, thanks – I like that idea! I need to buy these ingredients. The bars look delicious. Thanks, Faye – you won’t regret it! Soooo good! And I think I have all of these ingredients in my pantry! Hell-oooo Saturday night! Sounds like my kind of Saturday night! Oh my yum! these shortbread treats look and sound amazing! Yummmmmmmm! And I love that they are paleo! Two thumbs up! Oh God !!! Look at that tower of those ‘Shortbread’ squares – i’m literally drooling and the best part they are refined sugar & glutenfree. Simply Awesome!!! Thanks, Molly! Yay for gluten free! This looks like the perfect Paleo recipe! This reminded me of my childhood when we would sneak this into the shopping cart as a treat. Looks delicious! These look decadent, and I love the REAL ingredients you used! Aww, thanks Rachel! Real ingredients all the way! These looks absolutely yummy. Nothing better than shortbread. Looks awesome! I have never tried a millionaire before! They’re amazing – you gotta give it a try! Drool, licking screen, pinning, making these. We are always on the hunt for paleo recipes here! I am going to pin this one for later!! Thanks Bryon – beware! You’ll be tempted to eat them all! These look so good! I could definitely enjoy one (or two or three) with a cup of coffee!! Thanks, Renee! I go could for that right about now myself! I love anything with coconut oil. For me, it’s the best substitute for butter (not that I have a problem with butter). This recipe looks absolutely scrumptious! I agree- as far as butter substitutes go it’s my favorite. Thanks, Leslie! You can just hand over the whole pan. It looks irresistible. I look forward to making them. I can only come up with one word to describe this – scrumptious! I don’t have dietary issues so I typically don’t worry about all that stuff BUT these look amazing, even if they are “healthier” I want to give them a try!!! My mother in law is the same as you – doesn’t typically like “healthy” desserts, but she loved these. Thanks, Judy! Twix rendition in the form of vegan bars. i like the sound of that.And beautiful photos! These have my mouthwatering. OMG! These look too good to be true! My daughter has dairy issues so I’m always excited when I find vegan treats. Can’t wait to try these! Thanks, Susan! I totally understand your problem – my husband has lots of dairy issues as well as gluten, so I’ve been trying to make more vegan treats. These are probably my favorite treat to make – they’re soooo addictive! This looks amazing, Sarah!! 🙂 I totally need to make these!! Thanks, Sina! You’re going to love them! Thanks, Jodie! They’re well worth it! Aww, thank you! Hope you like them! I don’t have coconut flour – what could I use as an alternative? I have gram flour, would that work? I’m vegan and these look like they need to be in my mouth pronto! I haven’t tried this recipe with anything other than coconut flour so I can’t say for sure, but I read up on various flour substitutes for coconut flour to gauge what could work best. Gram flour is similar to coconut flour in density, so that’s a potential replacement – the main issue might be the taste. Bean flours typically have a very distinct taste which might put some people off whereas coconut flour is a little sweet to the taste. If you have oat flour I think that would be a good sub taste wise. If you don’t have oat flour on hand, but you have regular oats I used to make oat flour just by putting oats in the blender and blending for a minute. If it’s not entirely smooth that would still work out just fine for this. One last thing I’d recommend: if you do sub for another flour, add the liquid ingredients little bits at a time because there is a chance you won’t need quite as much moisture with one of the other flours and you don’t want to end up with a goopy mess. I hope that was helpful and I didn’t ramble too much! Let me know if you have any other questions or if you try it out how it works! This shortbread looks wonderful Sarah. I’m still trying to come to terms with using coconut flour for things like cookies and shortbread but will give this one a try over the weekend. Sarah – these bars are awesome. I think I could down a whole batch in a day. Seriously, one amazing bar. Love anything sweetened with maple syrup. Aww, thank you Allie! I’ve had to keep them covered in the back of the fridge to keep from reaching in and grabbing one every time I go in there. And I agree – maple is probably my favorite sweetener to use! Sarah, these look truly delicious and I have to agree – who needs a cup of sugar!? Love the fact these goodies are also Vegan, will be popping these little beauties on my Pinterest, Facebook & Twitter! Aww, thank you! I love a good vegan sweet – especially no bake ones in the summer when it’s hot out. They just hit the spot!